DIAL: Back dial with luminous filled applied indexes. Date aperture at 3 o’clock. OMEGA AUTOMATIC & Seasmaster 120 printed on the dial, Omega logo applied at 12 o’clock. Condition Report: Good condition. Dial is original with lume showing signs of aging. The hands have matching tritium lume. The case appears unpolished. The bracelet has been polished in the past. The bezel is intact with slight fading. 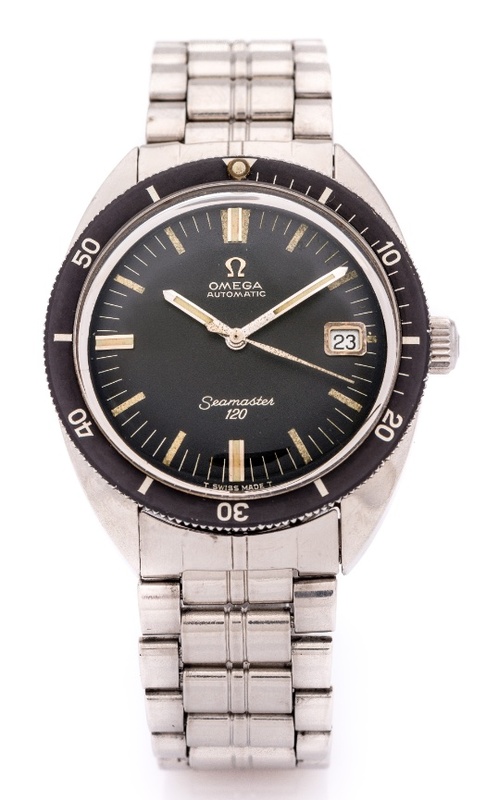 NOTES: The Seamaster was launched by Omega in 1948 to coincide with the brand’s 100th anniversary and is the oldest model in the current collection. Loosely based on the waterproof wristwatches made for the British military at the end of World War II, the Seamaster was first intended as a robust yet elegant watch for active individuals who wanted a watch for ‘Town and Country’. The first watches were equipped with self-winding movements in both standard and chronometer versions, the latter being universally appreciated for their robustness, accuracy and reliability. The key to these watches was the O-ring gasket. At this time, water-resistant watches generally used lead or shellac gaskets which were susceptible to temperature changes. The Seamaster, however, used a rubber gasket of the type that had proven its abilities in submarines during the Second World War. The Swiss Laboratory for Watch Research independently tested 50 cases of the Seamaster at a simulated depth of 60 meters. After temperature changes of -40° C to 50° C in quick succession, the cases showed no sign of water infiltration. The engineers at OMEGA were so sure of the Seamaster that one flew over the north pole attached to the outside of a DC6 in 1956.